A review of “Wild at Heart,” a show of works by Seattle painter Adrianne Smits and Portland sculptor Travis Pond at Bryan Ohno Gallery in Seattle. There’s the recycling that we all do — and then there’s recycling the way Travis Pond does it. The Portland artist’s 10 sculptures at Bryan Ohno Gallery (nicely matched with work by painter-ecologist Adrianne Smits in a show titled “Wild at Heart”) are all made of “re­purposed” steel. Pond’s subjects are crows, bears, dragonflies, etc. But they aren’t simply cast in steel the way that Tony Angell casts his birds in bronze. 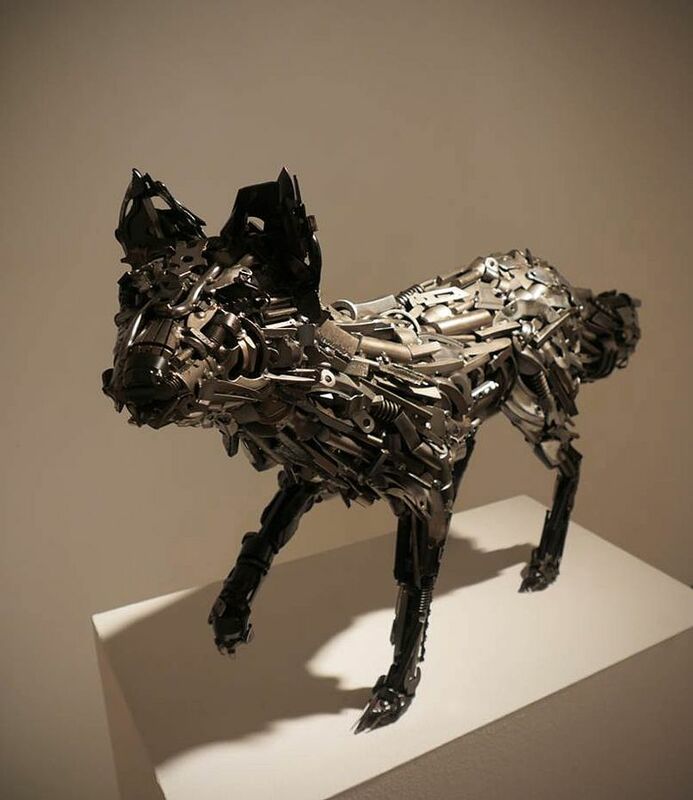 Instead they’re hand-welded assemblages of hundreds of metallic fragments, culminating in creatures clad in intricate, postindustrial feathers or fur. 11 a.m.-5 p.m. Wednesdays-Saturdays through Aug. 29, Bryan Ohno Gallery, 521 S. Main St., Seattle (206-459-6857 or bryanohno.com). Pond makes no attempt to hide his source materials. The wings of his dragonflies, for instance, are made largely of bent spoons. Look closely at any of his pieces, and you’ll see all sorts of steel bric-a-brac incorporated: screws, wrenches, chisels, springs, cogs, pliers and a variety of kitchen implements. You can even spot brand names (Next Day Gourmet, Acme) and the odd patent number. While Pond’s work materials are obviously industrially made, the sculptures themselves have a feral energy. They look like creatures caught candidly in the wild, either on the prowl or, if they’re potential prey, on the alert. From a distance, Pond’s dark, gleaming crows might even be mistaken at first for the real thing — even if they’re a few degrees larger than life-size. Most of the pieces are polished with a black patina lacquer finish that effectively masks how miscellaneous their ingredients are. In “Dragonfly I” and “Dragonfly II,” however, the steel is unvarnished, giving the insects an apt tracery-like delicacy and silvery sheen. With “Dead Robin” and “Feathers,” Pond creates what amounts to an installation. His robin — on its back, one eye half-closed, legs in the air — is as vividly deceased as its companion pieces are vividly alive. Oversized feathers floating up the wall above it read almost like its avian spirit escaping its corpse. Seattle artist Smits’ nine watercolor/gouaches and one enormous oil painting truly complement Pond’s work, offering his creatures beguiling sylvan settings to inhabit. Trained as a field ecologist, Smits makes on-the-spot studies of West Coast groves and glades, with an occasional glimpse of a distant mountain horizon. Her main focus is the tangled underbrush and moss-covered deadfall of any forest scene. 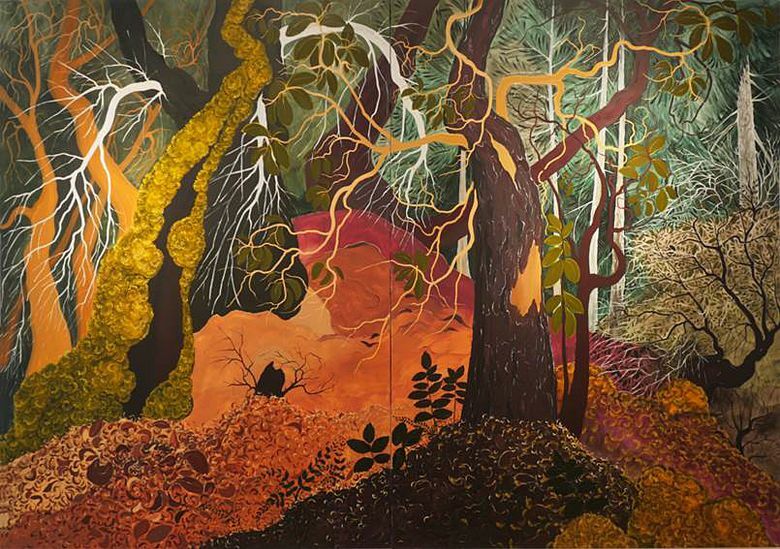 Natural forms (branches, leaves, rocks, logs) are rendered in a stylized shorthand reminiscent of French painter Henri Rousseau’s jungle paintings. While these smaller works have the feeling of al fresco chamber pieces, then her gigantic, untitled oil-on-canvas has the scope of a grand outdoor symphony. It’s an 8-foot-by-12-foot diptych in which several kinds of “treescape” seem to have fused into a single richly composed space. If the canvas would just “give” a little, it seems, you could easily take a stroll through the woodland dell it depicts. If Smits’ work looks familiar, that’s because she had a solo show of similarly huge oils-on-canvas titled “Immersion Redux: Buiten (Outside),” earlier this year at the Museum of Northwest Art in La Conner. Her work at Ohno’s gallery makes me sorry I missed it.